Weak Chinese trade data, the unofficial kickoff of fourth quarter earnings season, and the ongoing government shutdown are on investors radars this morning. Weak trade data adds pressure on China. China’s exports fell 4.4% year over year, well below the expected 2% increase, while Chinese imports significantly missed expectations slipping 3.1%. Both figures were the worst since 2016 and about 10 percentage points below the November readings. Clearly influenced by trade tensions, as well as front-loading ahead of the implementation of U.S.-imposed tariffs, this marked slowdown likely puts additional pressure on China to strike a deal, while the potential impact on global markets may increase urgency for the Trump administration. Fourth quarter earnings gets under way this week. Over the next five days, 35 S&P 500 companies will report quarterly results, highlighted by several big banks starting today with Citigroup’s results. In today’s Weekly Market Commentary, which we’ll preview on the LPL Research Blog, we take an early at look fourth quarter earnings, discuss several key drivers, and share some thoughts on the outlook for corporate profits in 2019. We expect a solid economic backdrop to support earnings in the mid-to-high teens for the quarter, while estimate cuts-in part China/trade related-have likely lowered the bar enough for corporate America to clear it. Although several high-profile companies including Apple have warned about weaker results, overall pre-announcements have been consistent with recent quarters, and profit margin trends remain positive. A historic shutdown. The U.S. government is in its 24th day of a partial shutdown, which is now the longest in history. The closure reached an inflection point on Friday, when government workers’ first payday during this closure passed without a paycheck. In this week’s Weekly Economic Commentary, we’ll highlight the economic impacts of past shutdowns, and outline scenarios for the current shutdown now that we’re in uncharted territory. The week ahead. The kickoff of fourth quarter earnings season highlights the start of the week, with several large financials set to report. On the economic data front, look for U.S. retail sales, producer prices, and several sets of housing data to garner attention, though delays due to the ongoing government shutdown are possible. In Europe, the world will be focused on Tuesday’s Brexit vote, although key inflation data will be released in the UK, France, Italy, and the composite Eurozone. The docket is light in Asia, though Japan’s core inflation is noteworthy after data last week showed wage growth picked up in November. 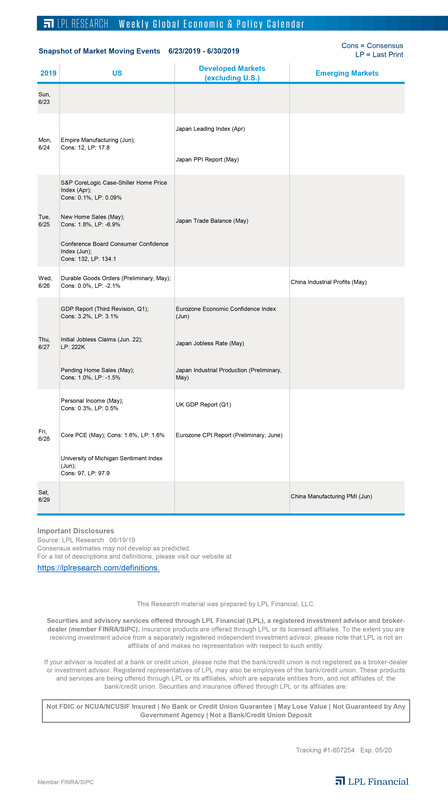 Also, fourth-quarter gross domestic product data from China will provide insight on the impact of U.S.-imposed tariffs.